It's no secret that I'm a tad obsessed with The Bazaar by José Andrés. 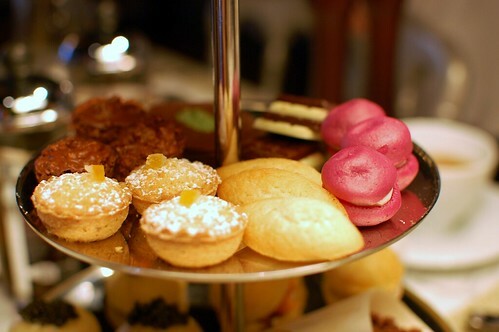 I was thrilled to go to high tea there on Sunday with Food Fashionista and sinosoul. High tea is at the Tres space, which is accessed through a different entrance from the main doors to The Bazaar. 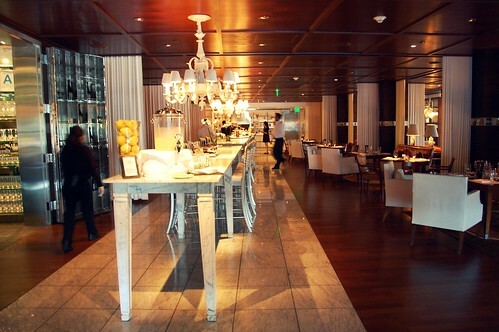 Tres has a similar through-the-looking-glass design, but, unlike The Bazaar, Tres is transcendently tranquil. Come in and feel the calm. From 3 to 5 p.m. daily, you can experience peace, tea, and dainty goodies for $26. 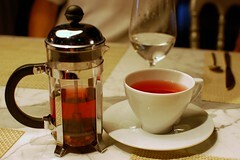 We each got a personal Bodum press with the tea of our choice, which was refilled by our server intermittently. I went caffeine-free with the Nobo Whole Fruit, which was a gorgeous warm red tea infused with wild strawberries, blackberries, and raspberries. So fragrant and so bright. I drank it sans sugar and loved it. Everything comes at once. 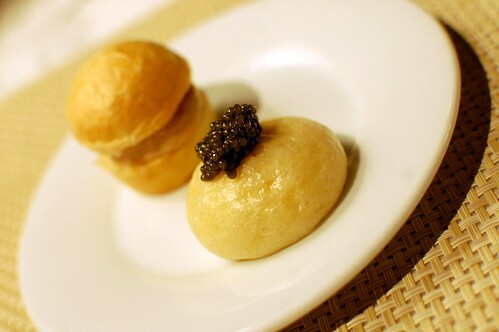 I began with some savory items -- bagel and lox cone, foie gras sandwich with quince, caviar steamed buns with crème fraiche. Exquisite as always. 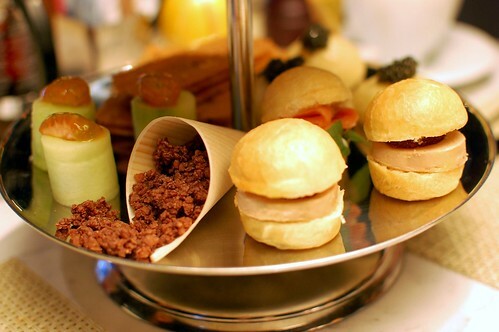 High tea may be the most economical way to experience the creative wonders here. Each of these tidbits usually costs $5. And this was just my salty beginning. FYI, when you eat chocolate pop rocks, the noise is not, in fact, only in your head. 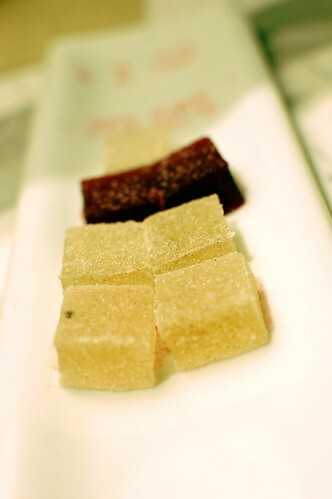 Those things are like super loud firecrackers -- Chinese New Year in your mouth. Everyone at the table can hear the poppin' party. Eat the berries. 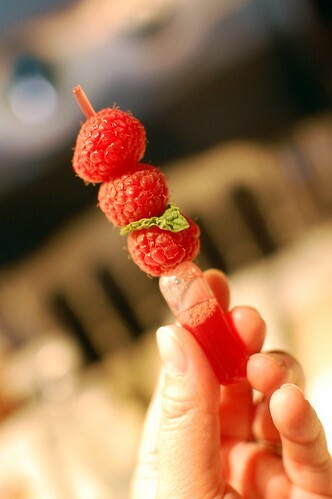 Squeeze the juice into your mouth. Fruit science. Mille-feuille-style. 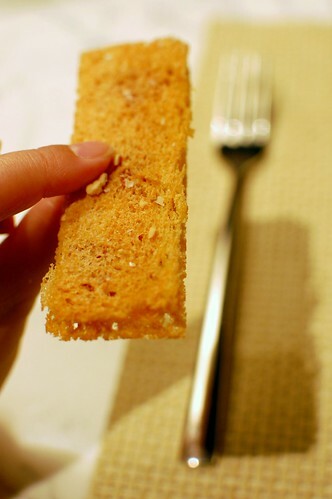 Light crisp layers of classic kid lunch awesomeness. 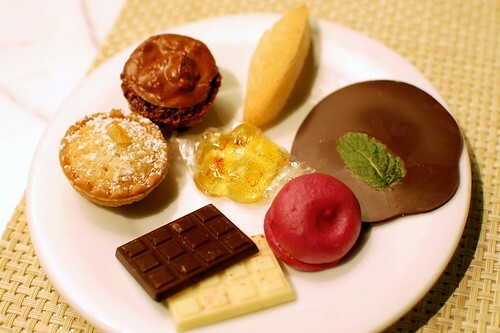 It's not an exhaustive list of everything on the tiers, but here's my plate -- almond orange tart, hazelnut volcano cookie, saffron pâté de fruit, financier, mint chocolate after eight, beet macaron with goat cheese, chocolate tablets. Absolutely delectable. All of it. This would be the end of high tea for most people. But we're not most people. We're lucky people. Our friendly waitstaff gave us some extras that had not been served at brunch. 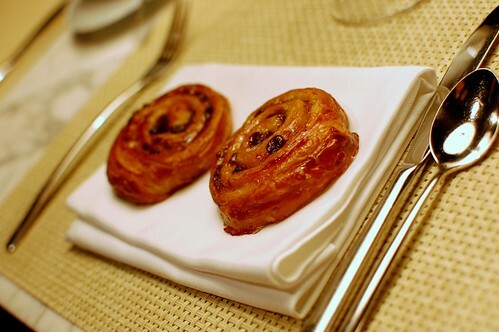 I'm quite certain that the pastry chef here is a genius. The pink nougat, mousse, and panna cotta were particularly dreamy. Even the leftover bags here are adorably chic. Gotta love that brilliant SLS marketing. What a wonderful time we Shared last Sunday (SLS)...can't stop talking in SLS talk to you & Tony for a while. Love ALL your photos and look forward to sharing another exquisite meal soon. So was it well worth the $26 even without the extra goodies at the end? great pics and all that food for $26? That's like highway robbery for a place like Bazaar! How did you score the extra treats? At first I thought $26 for tea was ridiculous but then I saw how much food you got and how good it looks. Yum. This puts to shame pretty much every high tea I've been to. 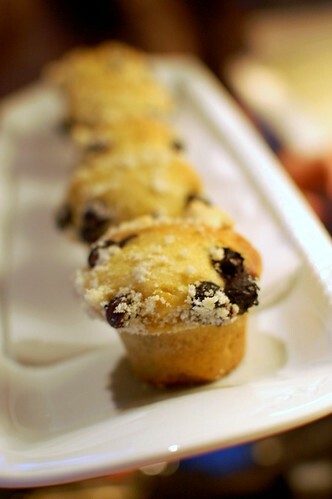 So delicious looking. Great pics as always. The Bazaar should pay you for all the PR you do for this place. Big bucks. 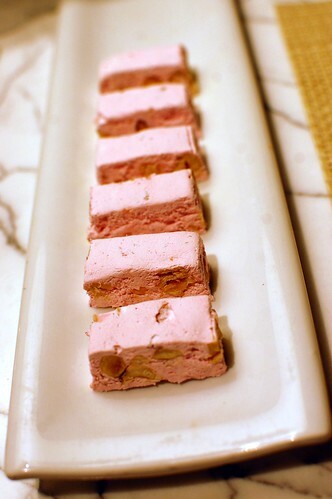 pink nougat??? what did it taste like? i heart nougat so much! i am unbearably sad to have missed this. hopefully you'll take pity on me and the teen and go again someday. you sure love this place...they should engrave your name on a chair. 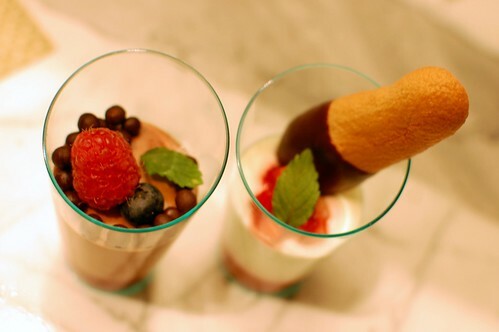 wonderful looking eats! This tea is really just too cute for words. Do you have photogs of Tony sipping from those precious little cups? so beautifully lovely! the food AND your photos! 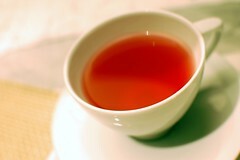 That is the most delicious looking tea I have ever seen. And what a deal! i've only been to the bazaar once for drinks and i love it! there is just so much to look at there and ah, love. 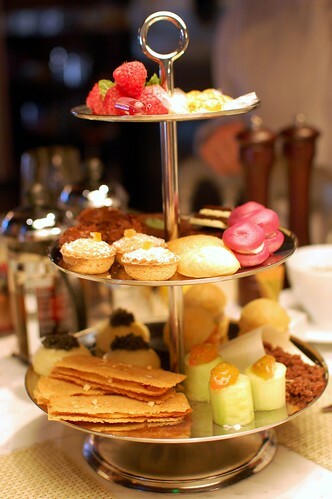 and seriously that high tea special is amazing and looks delicious and fun, i may have to check that out. Is it just me? the post is showing up really weird. The blog is just one narrow column. 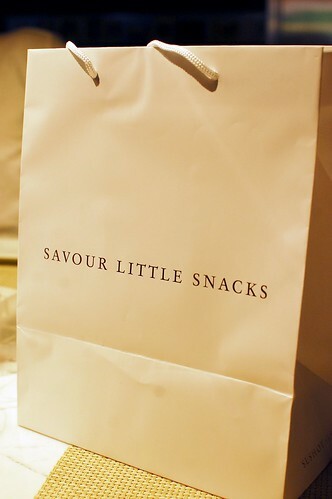 I love how cute the little food is, and nice swanky bag. Ditto HaveShoes, $26 initially sounded like a lot for tea but it sure did come with a lot. Cannot believe that it's a mere $26. So dainty and classy without being boring! 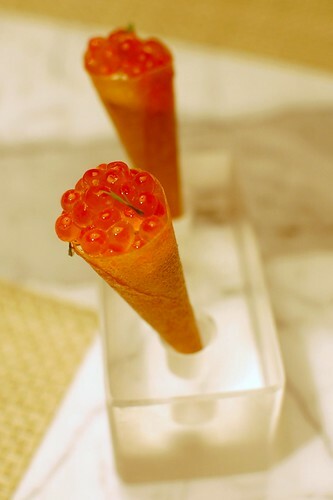 ooh I love the modernist version of high tea, it looks delicious and innovative! I am so having tea here... soon! I must go there some day. Yeah, I'm gonna need to go there, stat! omg, tea?! i must try this.